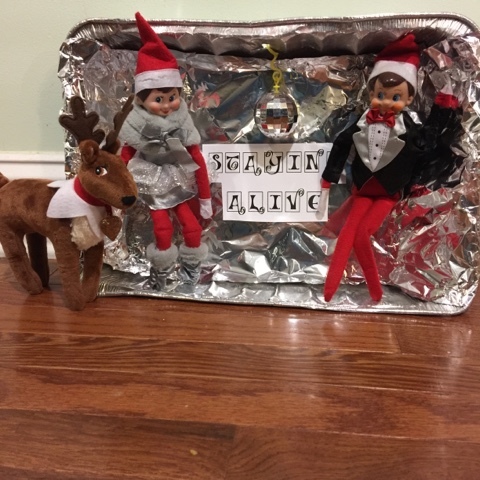 I wanted to share a little holiday fun we have been having since 2012. I was in the Hallmark store getting one of my "collector" ornaments that I get every year. Of course you guessed it..... Baking! I collect the baking ornaments so each year I make sure I visit the Hallmark stores to acquire the Hallmark collector ornaments. 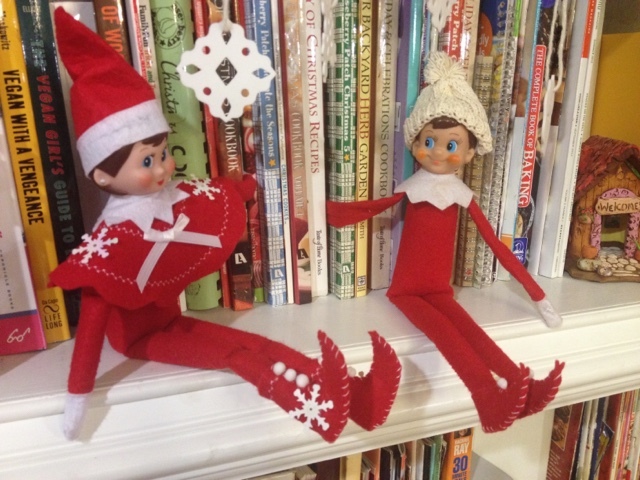 Well I spotted the Elf on the shelf and I was sold instantly. 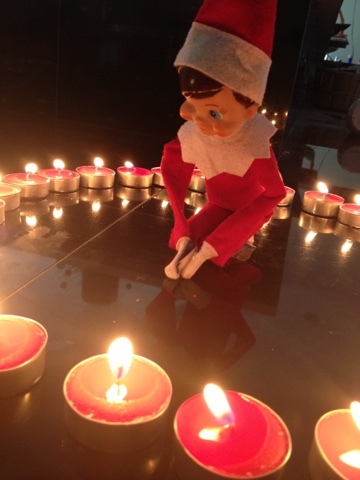 However I didn't or even expect our little elf would be such a Huge hit. 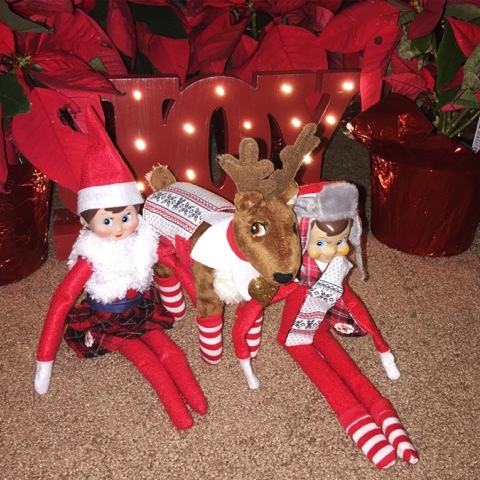 Well going on Christmas number four with our little elves has been a nice addition to our holiday traditions. This one I think I saw on Pinterest but not really sure. It was so cute!! This one I had bought the Barbie Doll at Target for a few bucks, I know a fabulous deal. Apparently "Baker Barbie" isn't so popular??? It would of been on my Christmas list for sure when I was like eight or so. I was like the Barbie kid!! My mother always complained to everyone I was hyper and she took me to the doctor for this, and he told her if I could play for hours with my Barbie Dolls then no I wasn't. I made them clothes, beds out of matchboxes using glue. I made dresser drawers out of matchboxes. I even took tomato packaging and made elevators to life them from boxes I had in a walk in closet. Like I said I was Barbie cray cray! 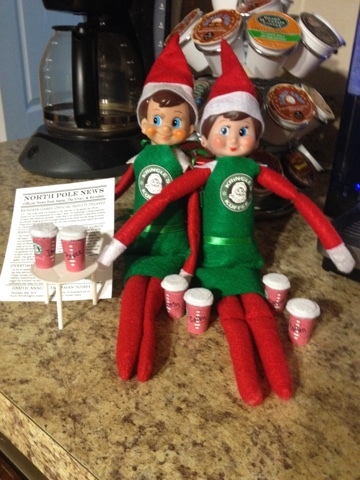 My boys called this is girlfriend that he went to the North Pole to get. 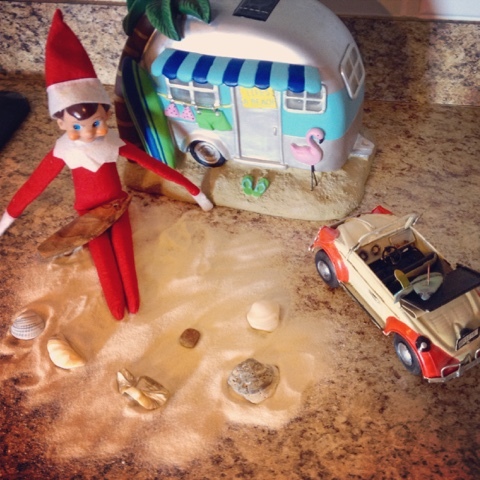 I used those like instant cookies from Pillsbury which the boys love! Instant magic! Here I started adding a chalkboard I bought from Walmart for like $3.98 and had them in a baking basket full of kid rolling pins, and giraffe whisks that I found at Target, and tiny gingerbread houses I bought at Roses. 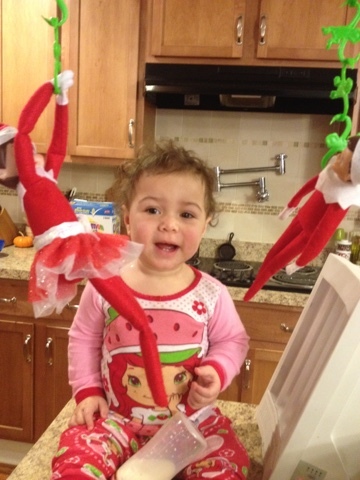 Both Houdini and Annie the Elf. 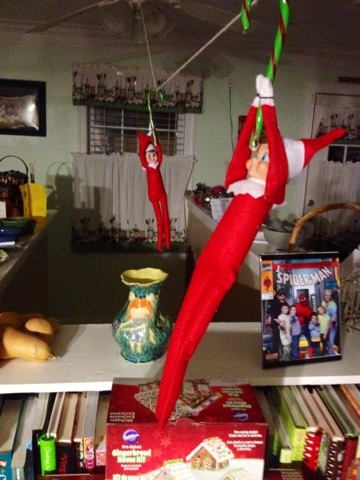 Here I had made a zipline from the ceiling fan to the kitchen light and used candy canes to zip through the kitchen. Again I think this was a Pinterest idea. 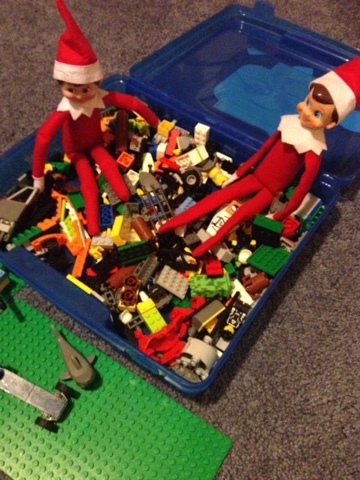 Here those little elves had got into the Legos which is so much fun and addicting. The boys love their Legos. All though I think everyone loves Legos! 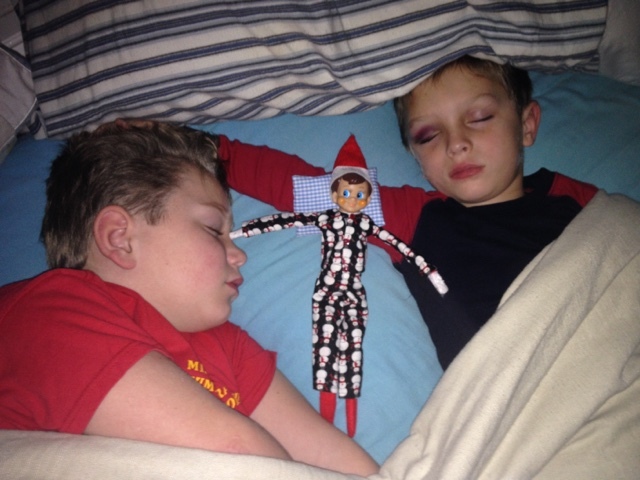 This must of been one of those nights I forgot and then bam in the morning oh yeah move the elves!! Quick before anyone wakes up. 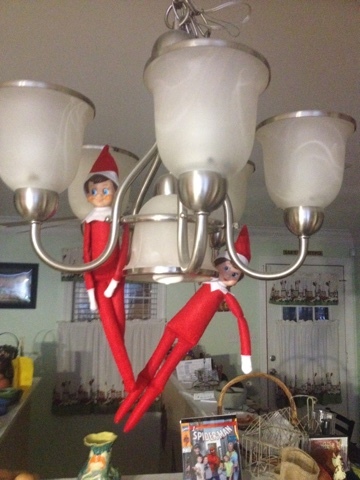 Quick thinking hang them from the kitchen light fixture. 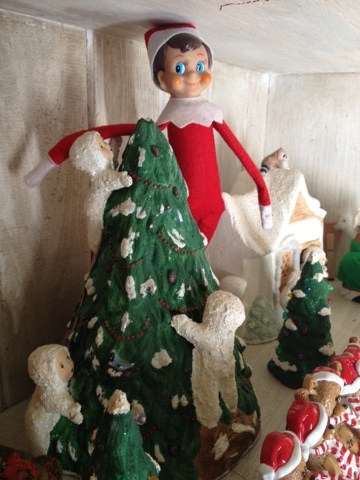 Here they landed on the Christmas tree I have in my bedroom which is a cheapo that I bought at Roses. It's white and I love it! It's just plain cute! 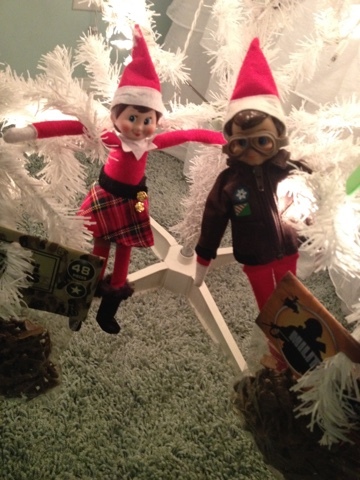 They arrived in flight suit and an adorable cute tartan skirt. 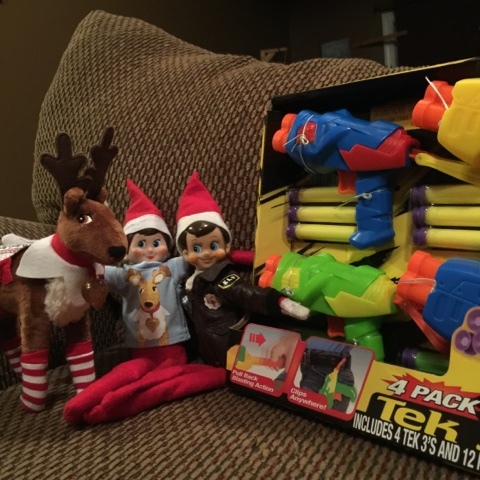 The elves brought plastic army men. Again another favorite of the boys! Here is where Houdini actually arrived in his flight suit. 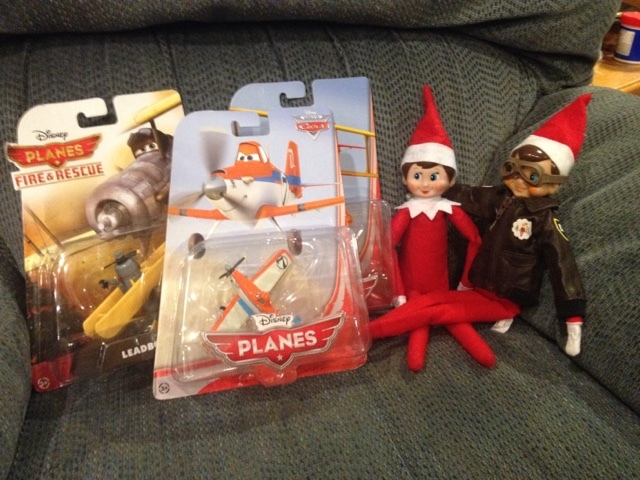 They brought Planes for the boys from Disney. Of course with a name like Dusty he had to have Dusty the Plane. 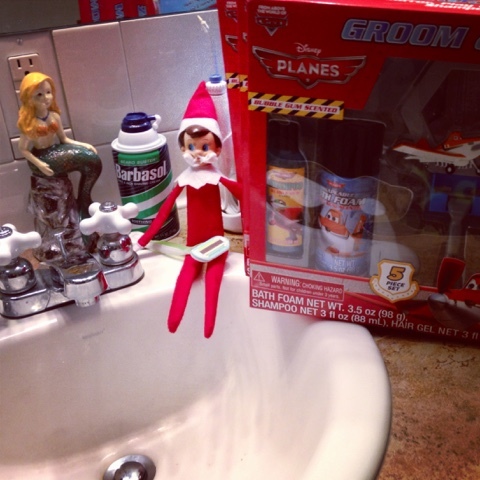 Then one night Houdini arrived with a shaving kit for all three of the younger boys. 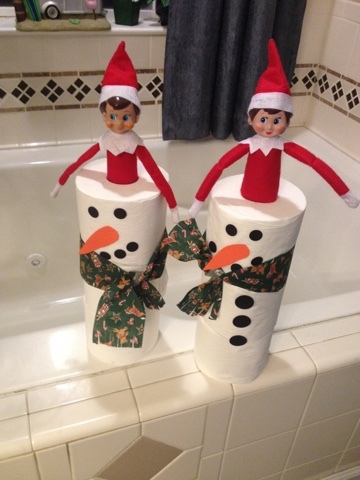 I bought these at Walmart in the holiday gift section. They were so thrilled with these. I have videos up on YouTube of them shaving it was just funny, I laughed at them shaving. 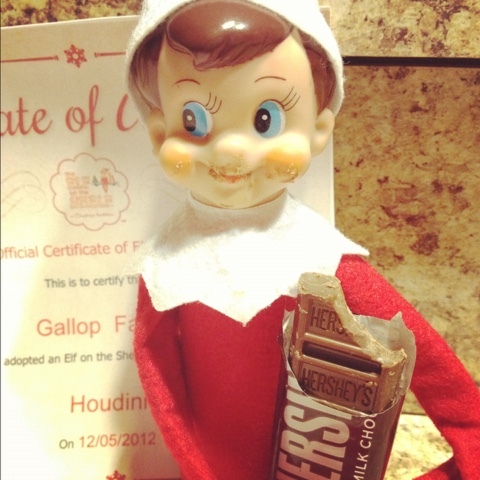 Here is where Houdini got into those yummy Hershey bars. He even had chocolate on his cheeks. 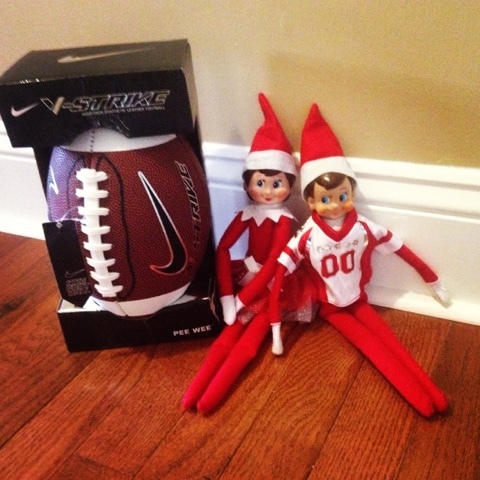 Houdini has his football jersey on and the boys got a new football, a favorite of them. 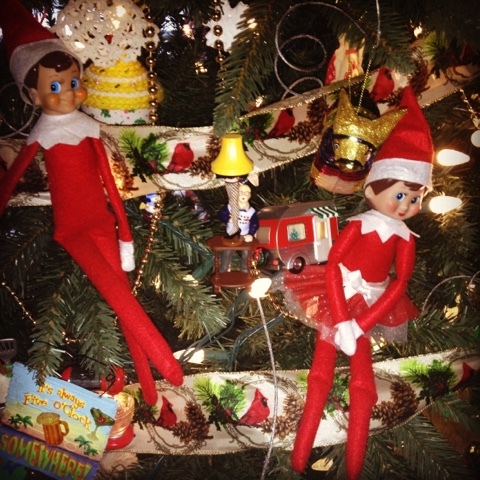 We found them in the tree again!! Annie has on her sweet skirt and it looks a new apron to bake with. 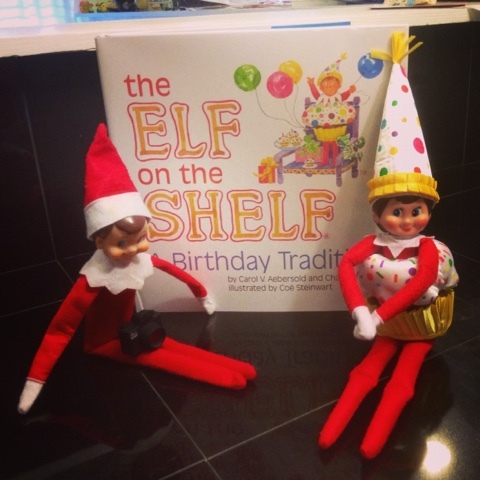 Houdini has his camera and Annie her cupcake outfit for Skylar's birthday every year on December 13. 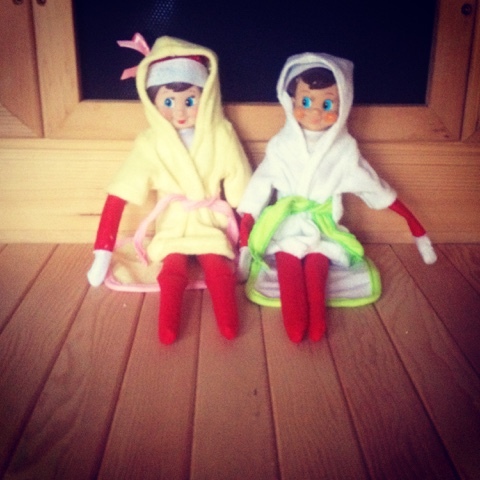 We found them in the sauna one morning in their sweet little robes. 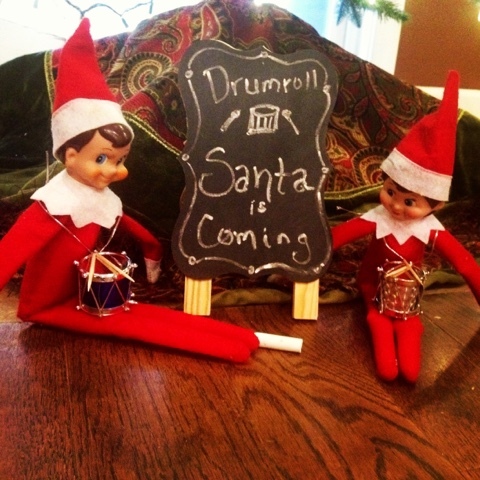 Drumroll on Christmas Eve one year. 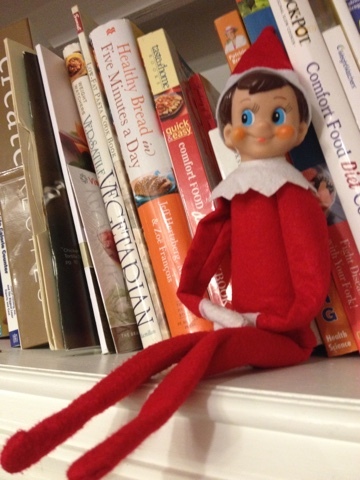 High up on the cookbook shelf. Houdini hides. These mornings it takes the boys awhile to find him. This was one of my favorites of them all I printed these off the internet sizing to fit. 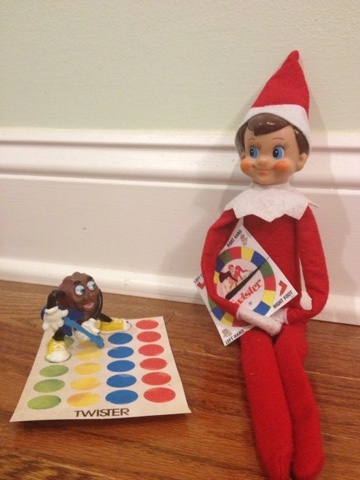 I used one of those vintage raisins from the late 80's to play Twister with Houdini. 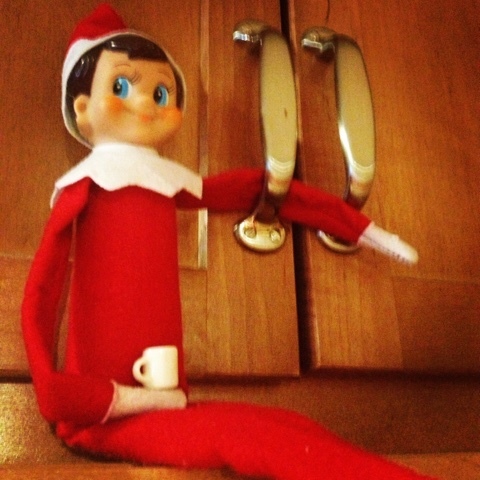 We found Houdini with a tiny coffee cup on the cabinet door. Houdini went and played with the snow babies. I painted these back in like 1995 and every several years I set them up. 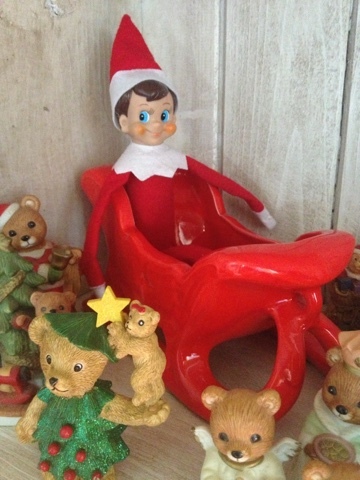 Look at how cute his he in the sleigh with all the bears around him. 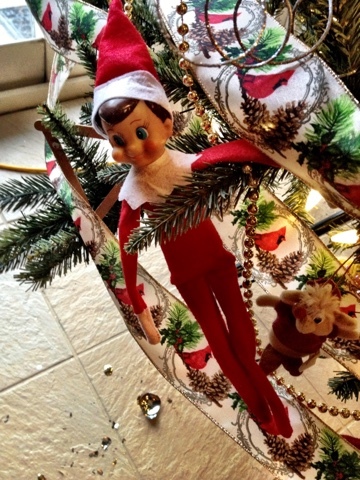 Back in the tree and breaking ornaments. He was being a little rotten Houdini. Hello nutcracker! 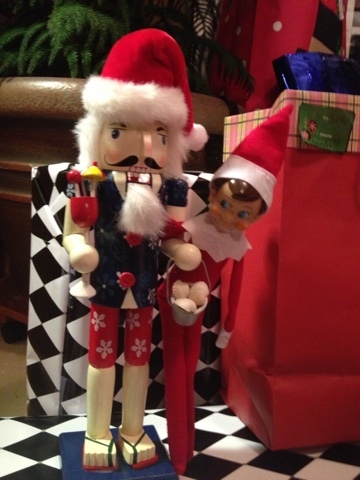 Yep you guessed it we found him with the nutcracker. Here is one my daughter Crystal sent me after the Sandy Hook tragedy. We used the idea too. 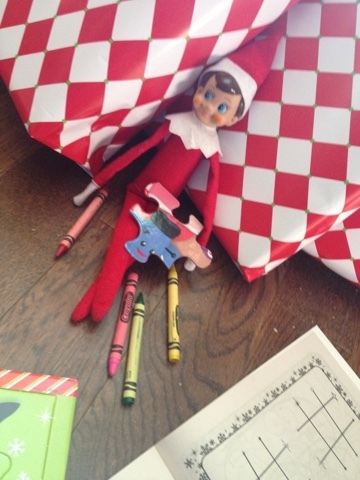 Crayons and coloring books with puzzles always great ideas and inexpensive. 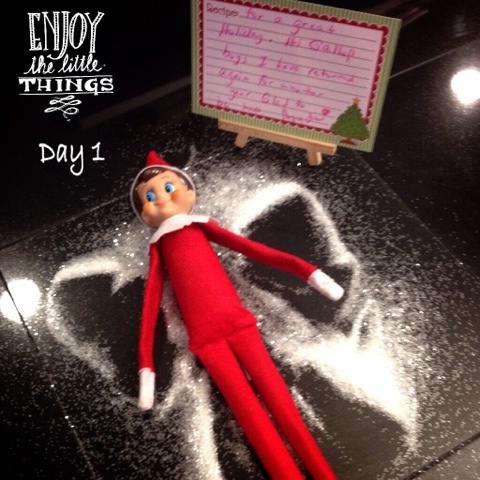 Back for another year in a glitter snow angel. I love this one a mustache. Well hello there!!! 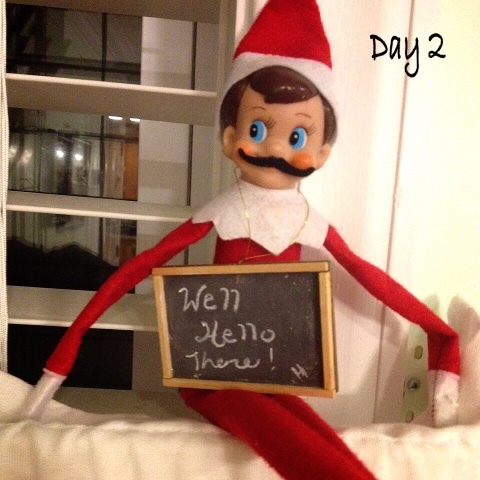 I had a whole set of mustaches for the boys from the dollar store. 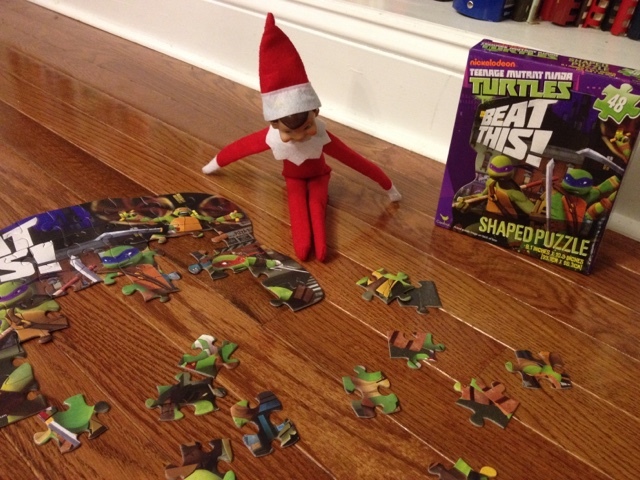 Puzzles are perfect they are fun and yet challenging, and you can buy them at the dollar stores. It also keeps the kiddos from playing video games and their tablets. I love puzzles myself. 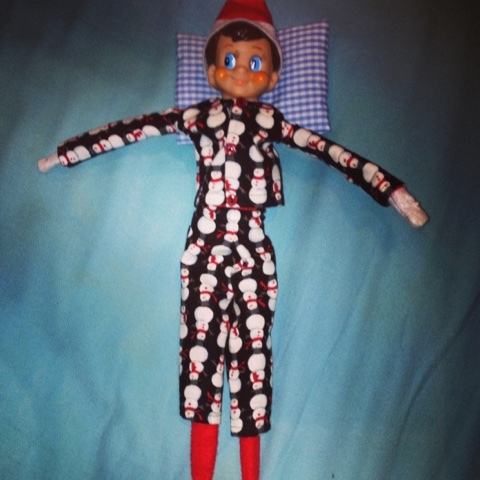 Of course Houdini got the cutest pjs off of Etsy. Oh my we caught Houdini playing one of Skylar's toys. 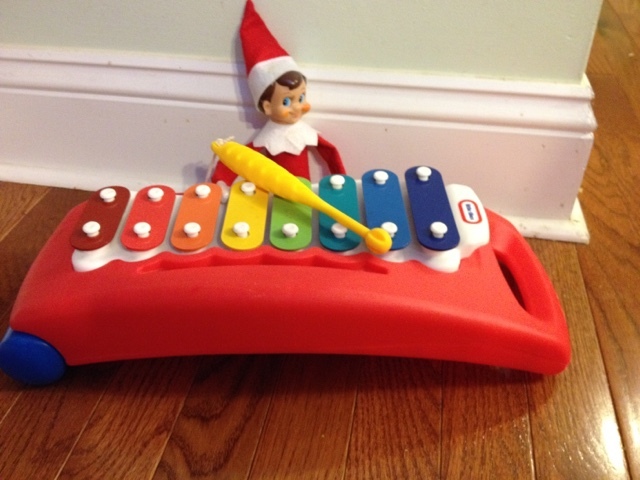 The Little Tykes Xylophone. Well I'm guessing Houdini got beach fever. 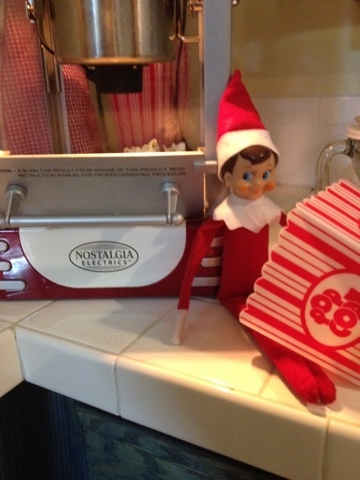 We caught him eating popcorn at the popcorn popper. Too funny! 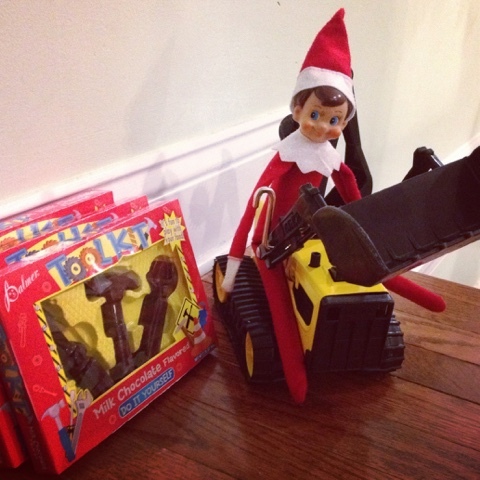 Then we found him on one of the Tonka Toys with chocolate tools. 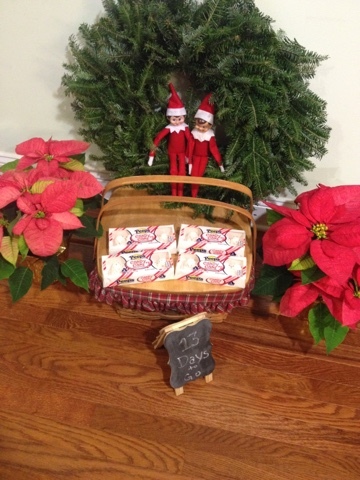 Of course the boys liked the chocolates. 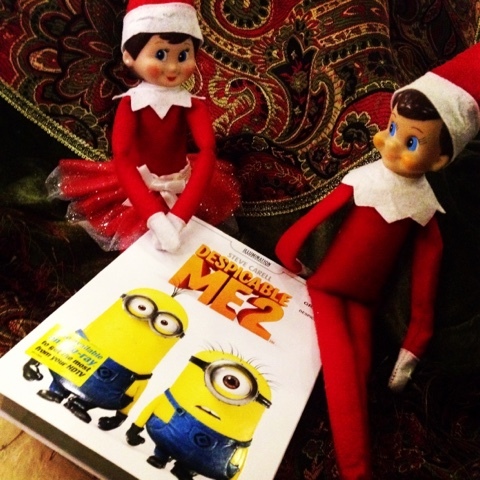 Houdini and Annie brought the new movie at the time, Despicable Me 2. Here they were hanging on the kitchen bar light by the monkeys from a Barrel of Monkeys. Skylar was intrigued by this. 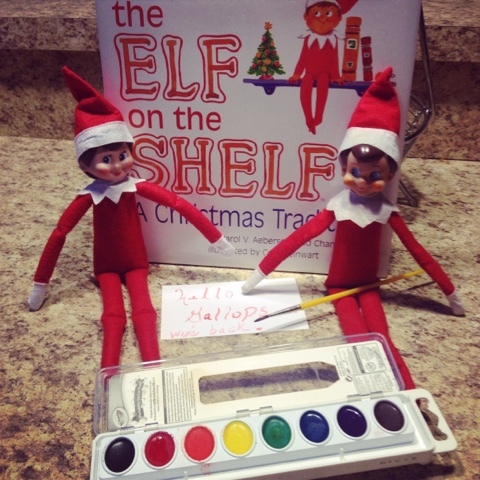 Here our little elves told the boys they were back for another year, in watercolors. 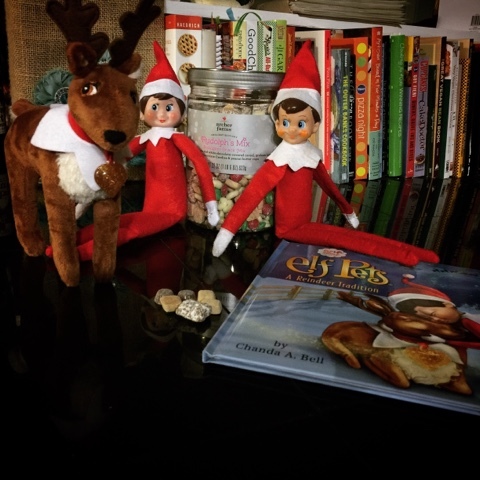 We are always finding them on the bookshelf. Oh my but look at how cute those little outfits are. The outfits came from Etsy. This has to be one of my favorites! Seriously how cute is this? I found these cute outfits on Etsy. Brilliant! 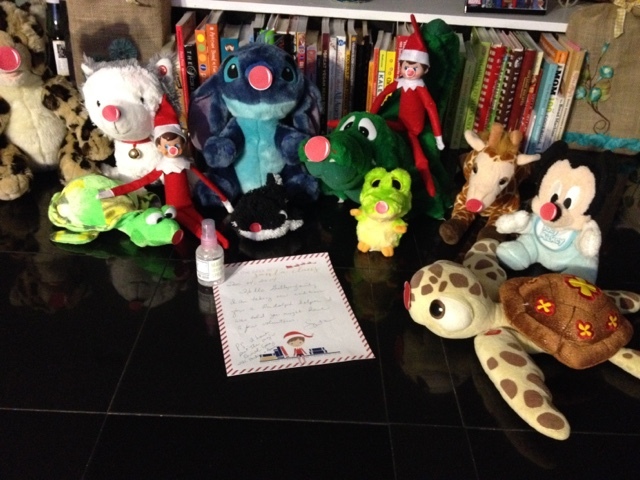 We found them on the kitchen table with reindeer noses on and a note, for magic spray. The spray is used incase someone actually touches them. It is made of water and a wee bit of peppermint essential oil with extra fine glitter/ mica powder. This was a printable from Etsy. 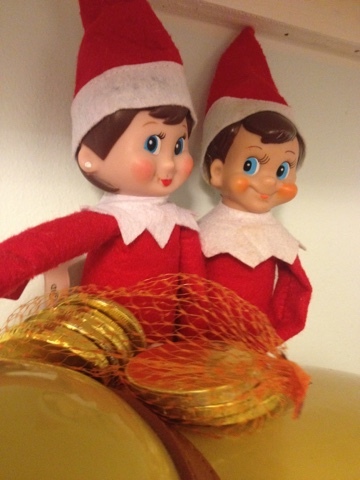 Here we caught them putting money in the laundry room piggy bank (which is more like a doggie bank). Rufus! I toss all the coins I find in the laundry into Rufus and when I don't find change I tell everyone Rufus is mighty hungry. LOL! 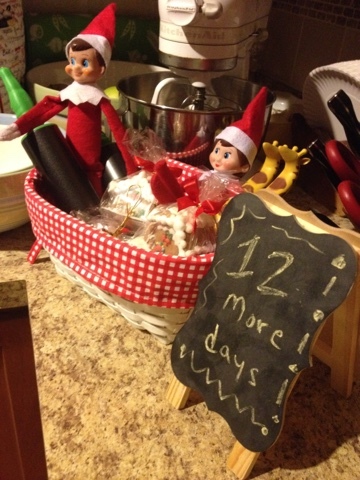 Here the elves left some candy. Peeps! On the couch with a new toy. Haha pirate elves. 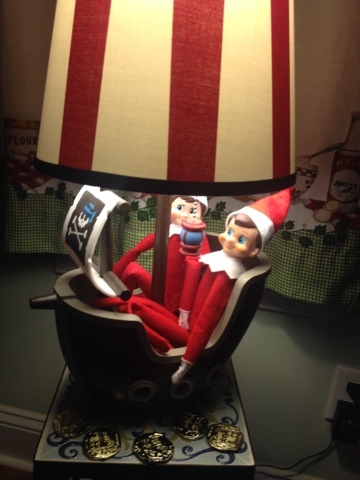 Found them on Dusty's lamp with pirate coins all around. Even on the floor. 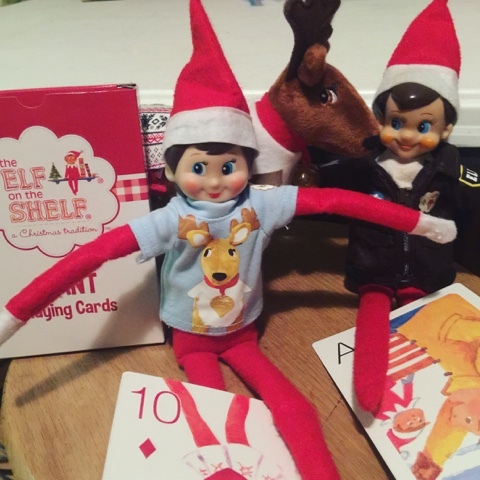 Beverly found these adorable cards at Kohls and more cute elf clothes. 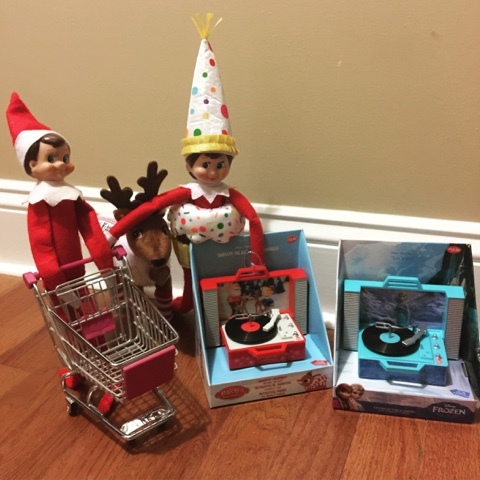 Out shopping for the day with new record players, I found at Walgreens. The birthday suit for Skylar's birthday which is December 13. Happy Birthday Skylar! More cute outfits with the Joy sign that lights up. 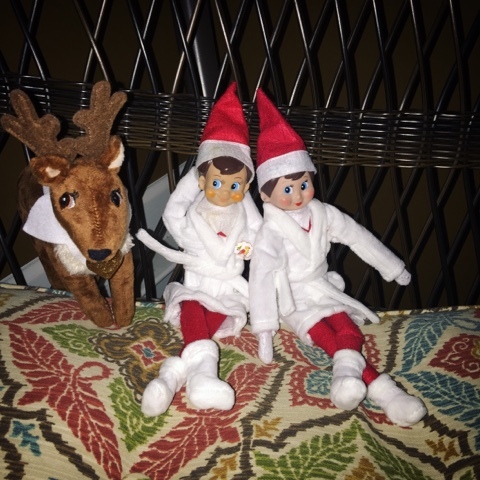 A day of relaxation with these adorable robes I found at Target. 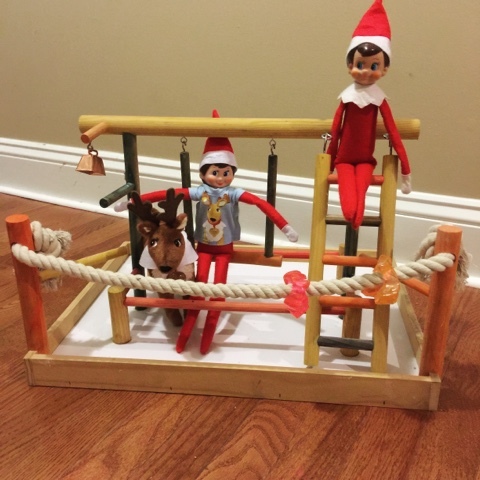 We found the elves in the swingasan. 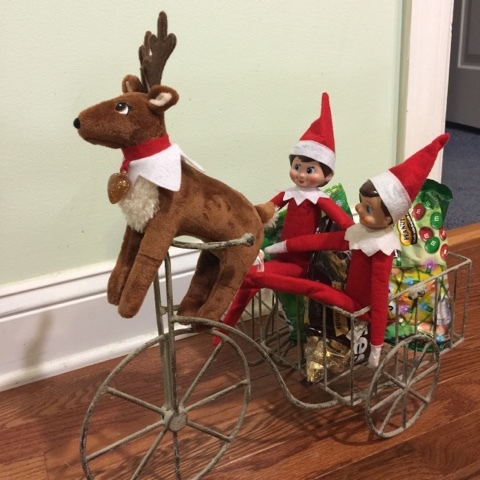 The elves were out riding around in this little bicycle filled with yummy candy of each of the boys favorites. 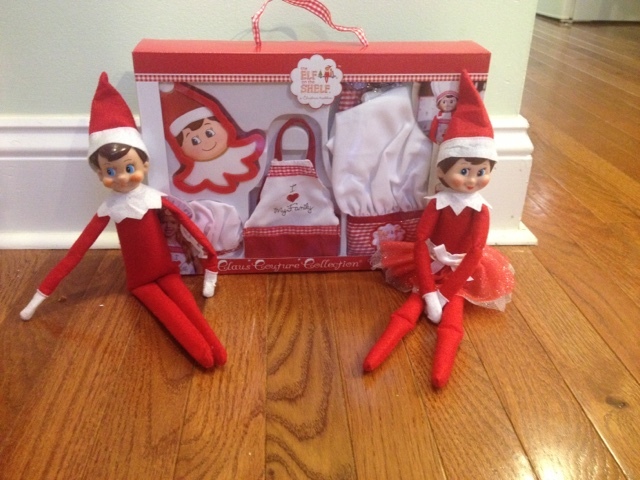 Look at those adorable elves in their handmade pjs from Etsy. 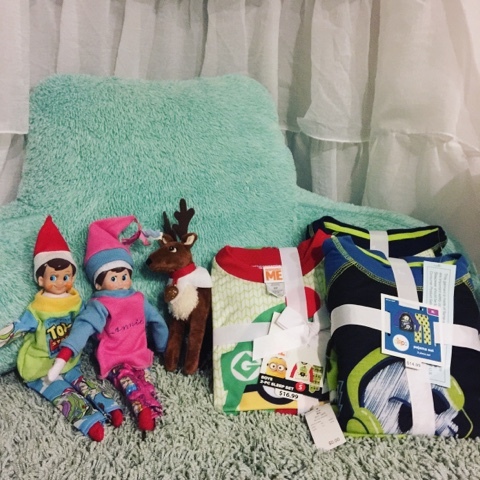 The boys also were left cute pjs from Target. 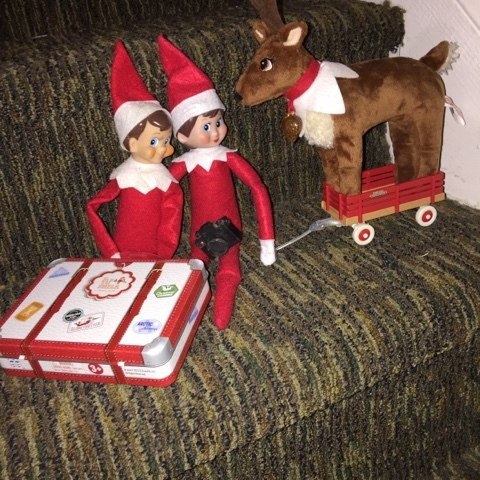 Found them out on the steps with the little wagon of the reindeer in tow. Suitcase to boot! 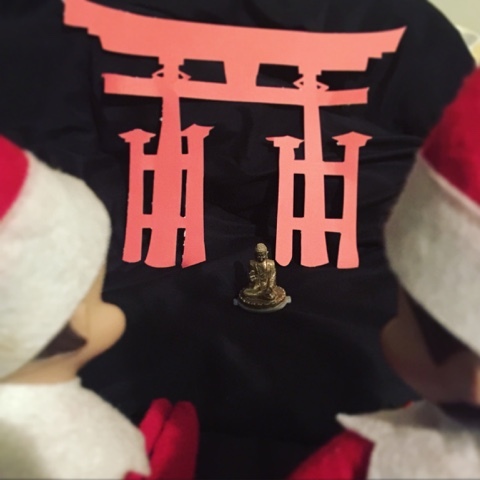 The elves traveled to Kamakura, Japan to see Diabutsu (The Great Buddah). I cut the Asian Gate with the Silhouette Cameo and used one of the toy Buddah figures in the tubes. I really like this one!! This where Ginger the reindeer was introduced and I found reindeer food at Target. Here in his football jersey with a finger football game. 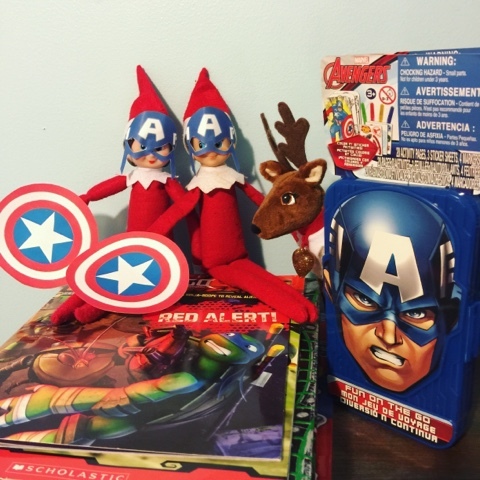 I found this adorable Captain America at Enzas Bargains. Staying Alive in their dancing clothes and a disco ball!! I can just hear that song now. 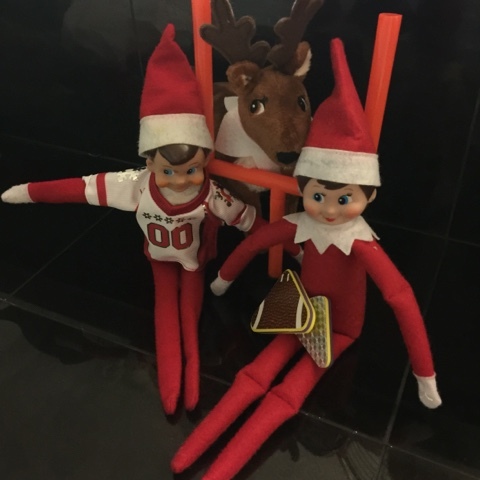 Here the elves were on Sonny's play gym. Sonny is our cocktail bird. 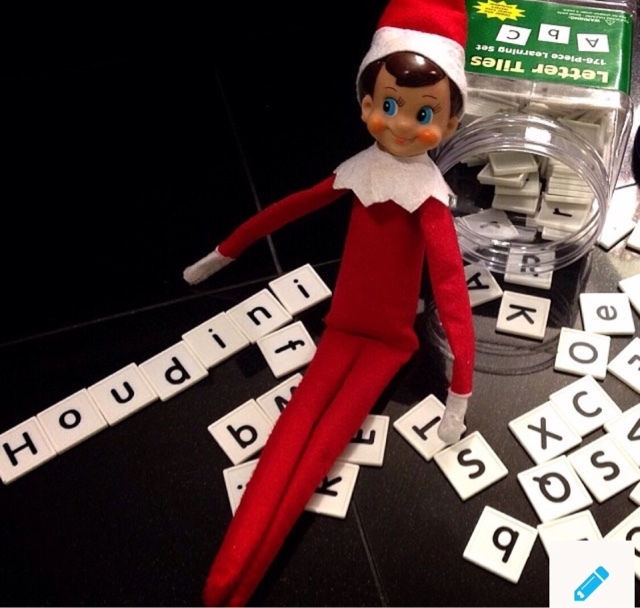 Here Houdini spelled out his name with Dusty's spelling word alphabets. 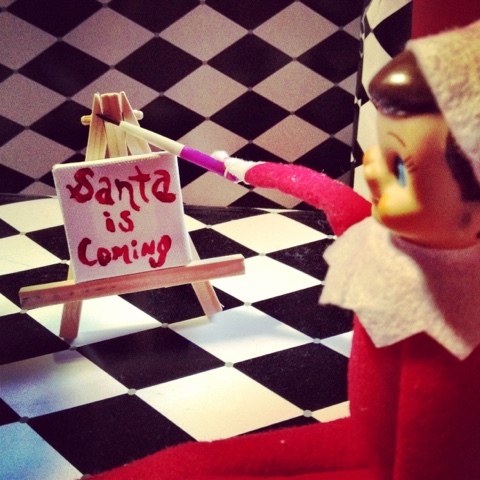 Santa is coming!!! Says Houdini as he paints on his easel. Happy Holidays I hope you Yuletide Season is a wonderful joyous time of year.